In summer of 2002, Yotam Gilboa traveled Israel with an amazingly diverse group of American and Israeli teens via the Nesiya Summer Program. On July 19, 2006, Yotam Gilboa was killed in the mountains north of Avivim in Southern Lebanon. He was 21 years old. 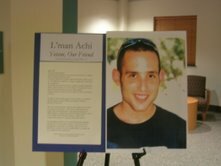 In response to his death, his friends from that summer of 2002–now college students at different universities–have reunited virtually to create a unique exhibit that shares their memories of Yotam (“strong, silent Yotam, exactly the kind of person you picture when you think ‘kibbutznik'”) through pictures and writing. The result is a rare exhibit that through its tale of humanity and self-sacrifice transcends the searing violence of this past summer. The exhibit consists of texts, photos and artwork, all carefully designed and selected. The exhibit is easily assembled and is a beautiful means of sharing a sense of Israel, the American-Israeli relationship and the sacrifice of young Israelis, which can often get lost amidst the politics of war. The exhibit is appropriate for Yom Hazikaron or any other time of the year. The exhibit will begin at Johns Hopkins, and then will hopefully travel to other schools including (to be confirmed) Cornell, Harvard, Brandeis, Yale, Princeton, NYU, Columbia/Barnard, YU, Queens CUNY, Penn, Goucher, Maryland, American, GWU and Oxford. Next Story → Mormon Shabbat?